Slicetruck: Words you can spell with a calculator, upside down with a calculator. 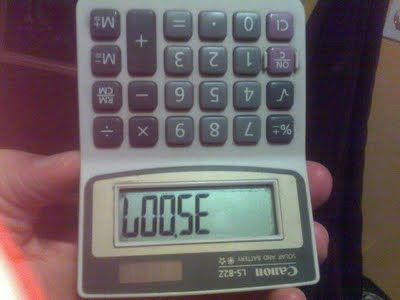 Words you can spell with a calculator, upside down with a calculator. Memorize this and you would be the coolest kid in which grade? but now that i've posted this list of words off the internet that I didn't closely inspect I'm wondering how you can put a zero to start a string of words? What makes a U? or how to differentiate between an L and an I. D and O next to each other don't look like anything. So what are the words that really look right when you spell them with a calculator? The most memorable one to me was old number thirty five thousand seven, but after researching the internet it seems that for most people the most memorable number is twenty eight thousand eight with twenty two million three hundred seventy eight thousand eight being the most used punchline. Like I've already realized, this list ain't great. Can you help with a better list? I've also noticed that calculators are nice because compared to a cell phone they weigh very little. OH, and what about stuff like 8, (ate) and that stuff?.. when spelling with a calculator? Hey Ryle Burr, I say burr, you're cold as ice with those nasty words!